Lake Cochrane is a 355 acre spring-fed lake located in Deuel County, SD near the MN/SD border. The residents who live around the lake have a Gary, SD address which is located seven miles north. Lake Cochrane is named for a pioneer, Bryon (By) Cochrane, who came to the area in April of 1872. He became the first permanent white settler in Deuel Coungy when he homesteaded the land on the south shores of the lake. He lived at Lake Cochrane until his death in 1949. 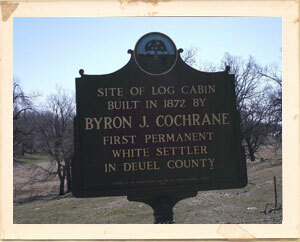 A historical marker marking the site of his log cabin built in 1872 can be found on the south side of SD Hwy # 516. When By Cochrane married Agnes Herrick of Gary, they were the first white couple married in Deuel County. The couple had three children. The Cochrane Homestead Home located on East Lake Cochrane Drive is now owned by his Great, Great-grandson, Wayne Cochrane. The eye- catching setting soon attracted other settlers. Areas land around the lake reflect the names of people who plated lots around the lake. Other areas were named for the landscape or for groups of people who used the area. There have been several ‘businesses’ around the lake. Jensen’s Resort, now Shady Beach, served the needs of area residents in 1916-1971. The Horstiens owned and operated a resort just north of Shady Beach. They sold block ice, sundry items, fishing licensees, and bait, held outdoor movies and rented swimming suits. Red Cross swimming lessons were conducted there. Others entrepreneurs had a bait shop, a hamburger place, and a gun shop. A stone bridge built either 1916 or 1917 located between 2856 and 2868 Edgewater Drive is listed as an historical site. At one time there was a mini-golf course and a dance pavilion at the lake. In 1955, Art Bostic deeded three lots to the State of South Dakota for $1.00 to be used as a public beach. This sandy beach on the north side of the lake was later incorporated into the present State Park Recreational Area. It contains thirty camp sites with electricity, water, dump station, comfort station, swimming beach, children’s play area and rental cabin. The Department of Game, Fish and Parks of SD owns a section along the west shore. It maintains a public boat landing there. Lake Cochrane is a fisherman’s delight. Northern pike, walleye, bass, crappies, perch and bluegills provide excitement for the angler. The State monitors fish population and has stocked the lake many times. In the winter, many fish houses spring up at the lake. The South Dakota Game, Fish & Parks indicates that in 2002 the mean depth was 13.2 feet and the maximum depth was 24 feet.